The Kangaroos smashed mountainous 604 runs after losing seven wickets in their first innings. The visitors were bowled out on 272 runs while chasing and the home side was able to manage 50 runs in their second innings while losing three wickets and enjoying an overall lead of 382 runs. The bowlers from both sides dominated the day by clinching 11 wickets on January 26, 2012, at Adelaide Oval. 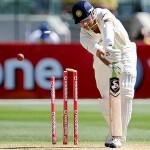 Earlier India started their first innings at 61 for the loss of two top wickets as 21 overs were delivered. 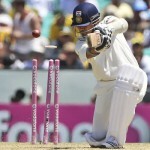 Gautam Ghambhir and Sachin Tendulkar were at the crease with 30 and 12 runs respectively. All eyes were focused on Tendulkar with an anticipation of scoring his 100th hundred in the match at a solid batting track. Ryan Harris initiated the day with a maiden over as both of the batsmen remained watchful in the beginning and managed 15 runs in the first 10 overs. Australia clinched the biggest success of the day when Tendulkar was caught in the second slip by Ricky Ponting on 25 runs on the bowling of Peter Siddle. The third wicket fell at 78 runs and Ghambhir followed him after the addition of just nine runs in the total at his personal score of 34. VVS Laxman and Virat Kohli tried to fight back but the earlier continued his poor form with the bat and went back to the pavilion at 18 runs. India was reeling at 111 for the loss of five wickets when Kohli took charge ably supported by the wicket keeper Wriddhiman Saha as the duo contributed valuable 114 runs for the sixth wicket. The keeper was bowled by Harris at 35 runs as a solo fight was witnessed from Kohli who smashed his maiden Test century on the first ball of the 92nd over. He became the first Indian Batsman to score a century against Australia in the seventh innings of the current series. The tail vanished without any resistance and Kohli was the last batsman who was gone after a heroic knock of 116 runs as Indian innings was folded back at 272 runs in 95.1 overs. Siddle was the star performer with five wickets, Ben Hilfenhaus held three as Harris and Nathan Lyon shared one wicket each. Australia gained a match winning first innings lead of 332 runs and their openers were unable to impress for the second time in the match. The first wicket was lost at 39 runs when David Warner was gone after scoring 28 runs. The lean period with the bat for Shaun Marsh continued when he was unable to open his account and Ed Cowan followed him after adding 10 runs to his credit. The hosts had lost three wickets at 40 runs when the experienced duo of Ponting and Michael Clarke joined at the crease and added ten runs in the total before the day’s play was called off. Ravichandran Ashwin claimed two top order wickets and Zaheer Khan held one. Australia still has a tight grip on the match and they will be focussing on winning the final encounter of the series.